The name of the city remains a contentious issue for some. 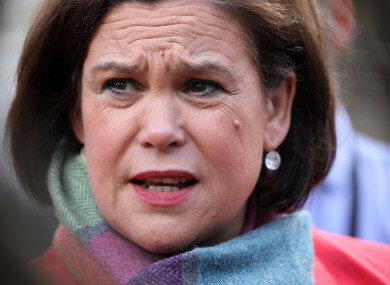 SINN FÉIN LEADER Mary Lou McDonald has defended her use of the name “Londonderry” at an event yesterday. The name of the city remains a contentious issue for some, with republicans typically referring to the area as “Derry” while unionists call it “Londonderry”. We have had an engagement with young people with interests across Derry, or Londonderry, and it has been a really wonderful conversation and one that we need to build on because… we have to live respectfully together and we know we can do that. McDonald was speaking after a meeting Presbyterian minister the Reverend David Latimer and members of his congregation yesterday. She also visited the Ulster-Scots Heritage Centre in Donegal. The party leader posted the video above on her Facebook page, which sparked some backlash in the comments section. I’m well aware of the history of Derry and Donegal. I used the term to reflect the fact that we had a dialogue – a really good one - with people who see things differently to us. McDonald also used the event yesterday to confirm that Sinn Fein would be supporting the Taoiseach’s nomination in the upcoming Seanad by-election – former Ulster Farmers’ Union president, and unionist, Ian Marshall. “I have met with Ian on a number of occasions in recent weeks and I have been impressed by his views on Brexit and the potential impact Brexit will have on the island, north and south. “I believe Ian will be a strong independent voice in the Seanad, providing an anti-Brexit unionist perspective, which is a welcome addition to the political discourse surrounding the issue in the Oireachtas. Brexit affects people from all backgrounds and ways of life; nationalist, unionists and everyone in between. “Ian is a unionist. I am an Irish Republican. As I have stated repeatedly, the Ireland I want to see is one where one can comfortably be Irish or British, both or neither. I believe Ian can bring a new and interesting voice to the discussion surrounding a New Ireland,” she said. The votes for the by-election will be counted on Friday. Email “Mary Lou defends using the word Londonderry: 'I'm well aware of the history of Derry'”. Feedback on “Mary Lou defends using the word Londonderry: 'I'm well aware of the history of Derry'”.